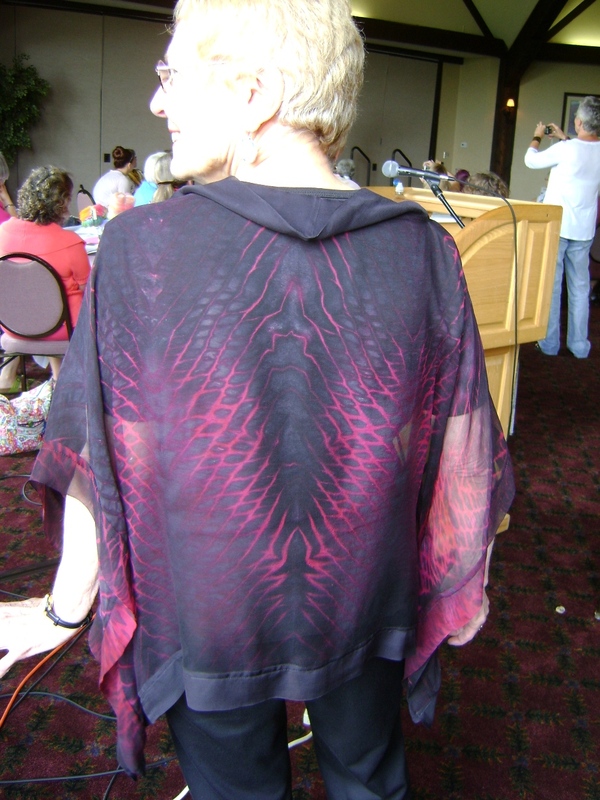 In the last post, I was telling you about the last day at Tan-Tara resort at the Missouri Fiber Artists (MoFA) conference. 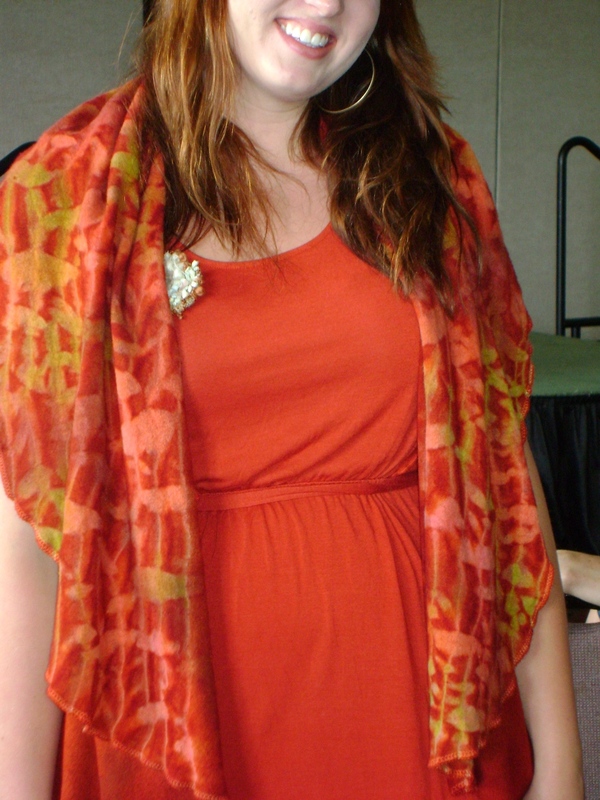 After Annie gave her presentation and we checked out her quilts, the style show was next. 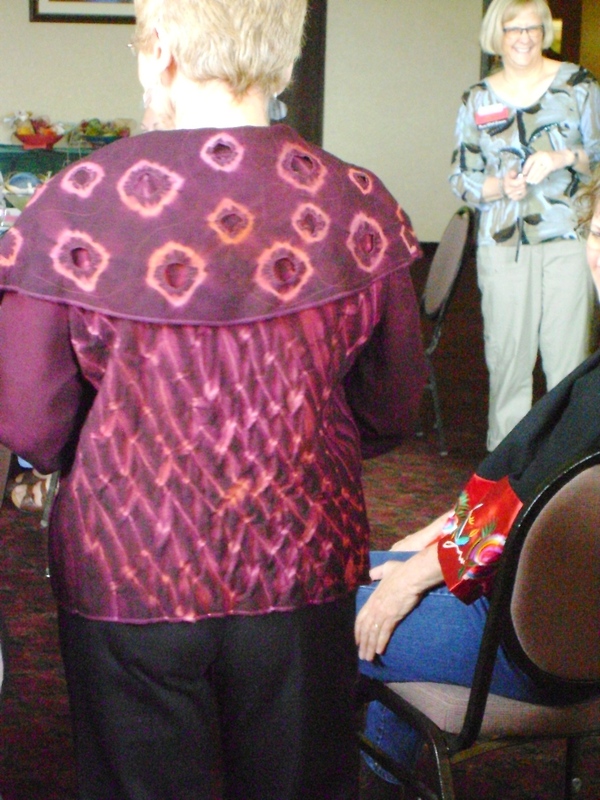 I took photos of almost everyone’s garment because they were all so wonderful, but there’s quite a few to post, so I will post a few here and if you are interested in seeing the rest, you need to join Facebook, Like the Missouri Fiber Artists page, and I’ll have the rest of them posted in an album…eventually! 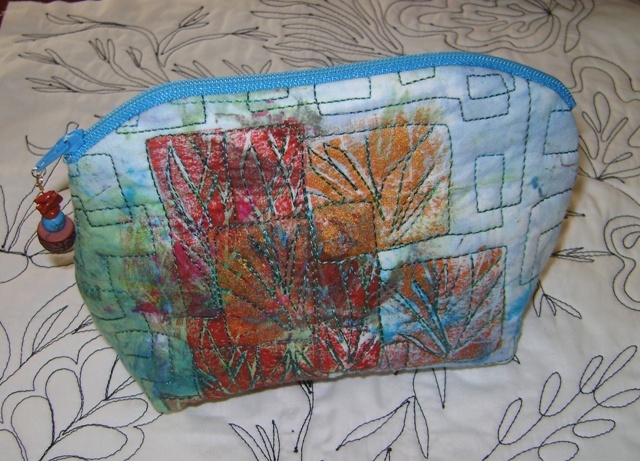 These gals can sew and not only can they sew, they are in to making their own cloth using surface design. The garments and ideas represented in the fashion show were awe-inspiring. I can’t tell you who made this. It all went too fast. This is a fiber student doing the modeling. This is Carlene Fullerton doing the modeling. 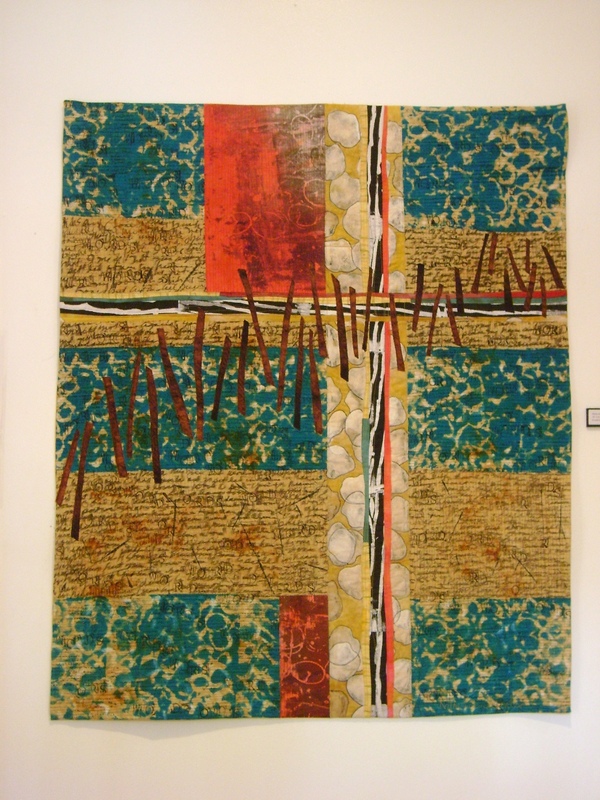 I think Sharon Kilfoyle is the creator of this smashing silk piece. 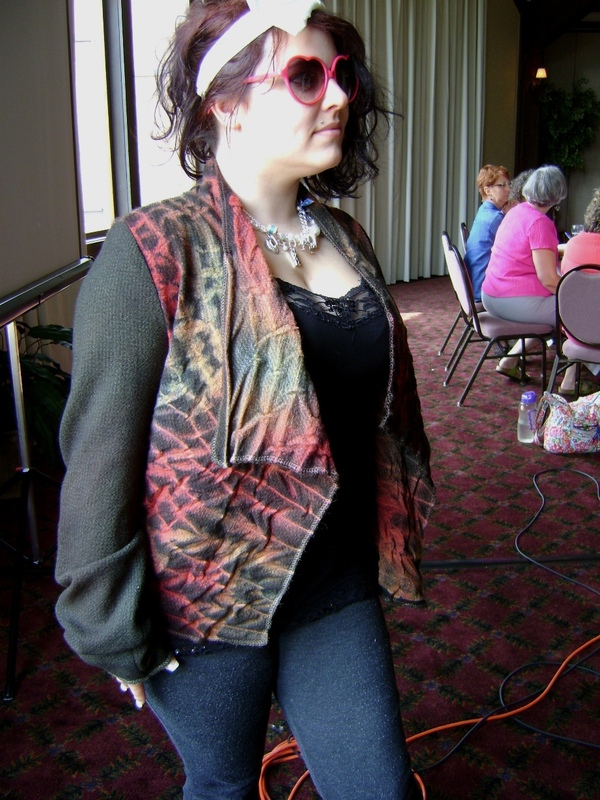 Carlene again modeling a gorgeous jacket. I thought this little orange jacket was quite creative. And the winner for Best of Show is…. 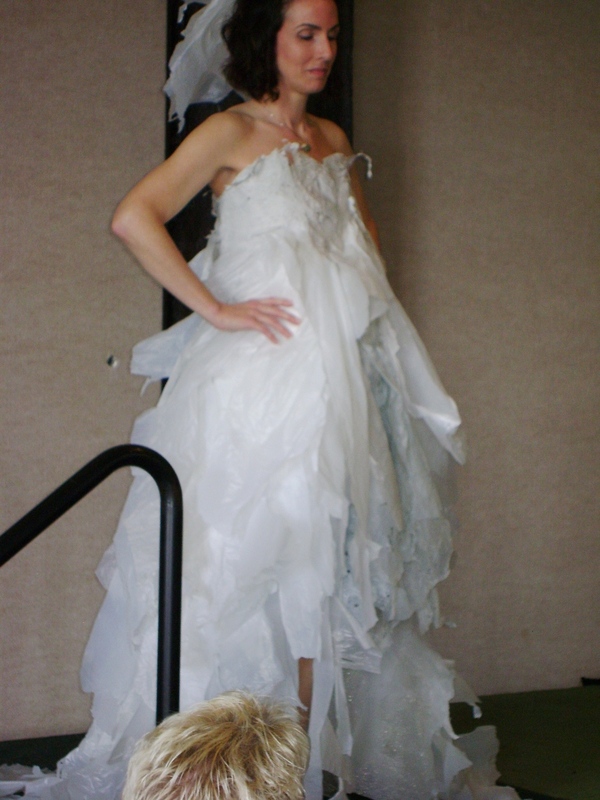 The wedding dress…made entirely of white plastic bags! One of the students made this. Stay tuned…Part 3 is coming. 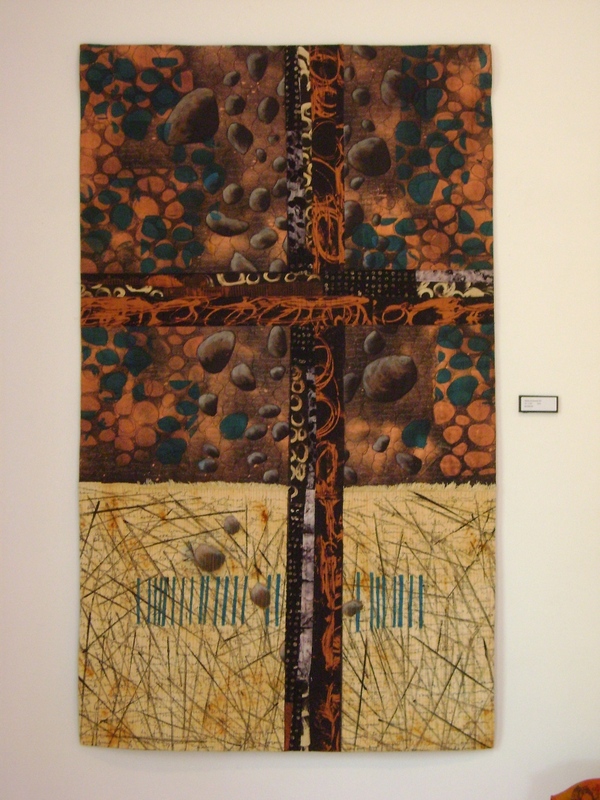 Here’s a couple more pieces of my exhibit that have not been seen on my blog before. 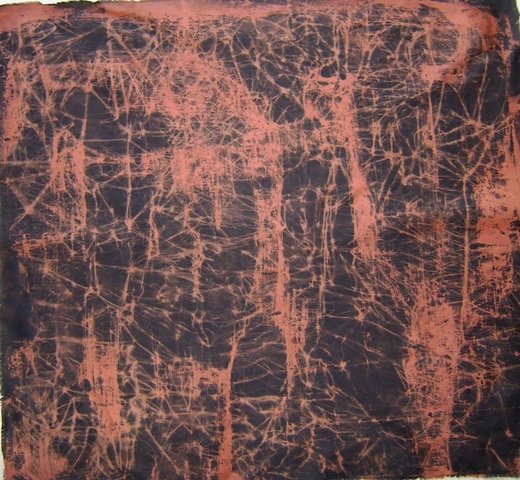 Rust dyed cotton sateen, silk screening, stenciling, applique, hand writing, paint, ink, dyes, stitching with polyester thread. 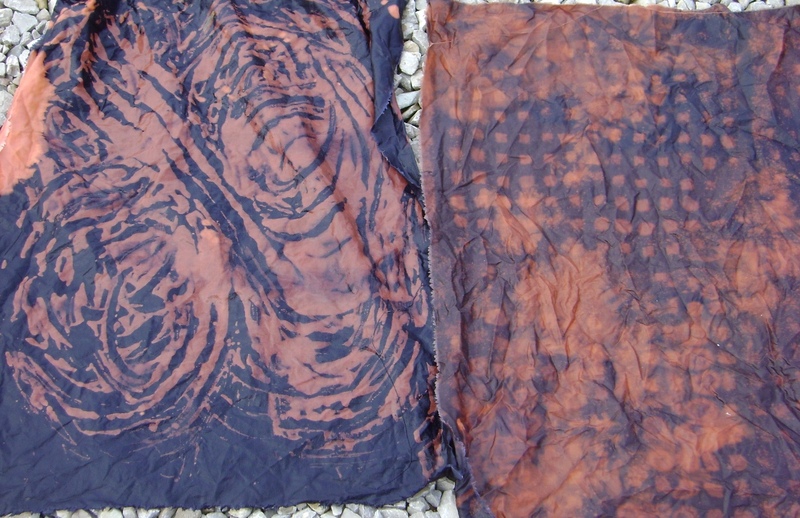 Rust dyed feed sack, discharge dyed cotton sateen, silk screened, stenciled and stamped, paint, dyes and automatic dish washing liquid and other discharging products, hand writing, inks, stitching with polyester thread. 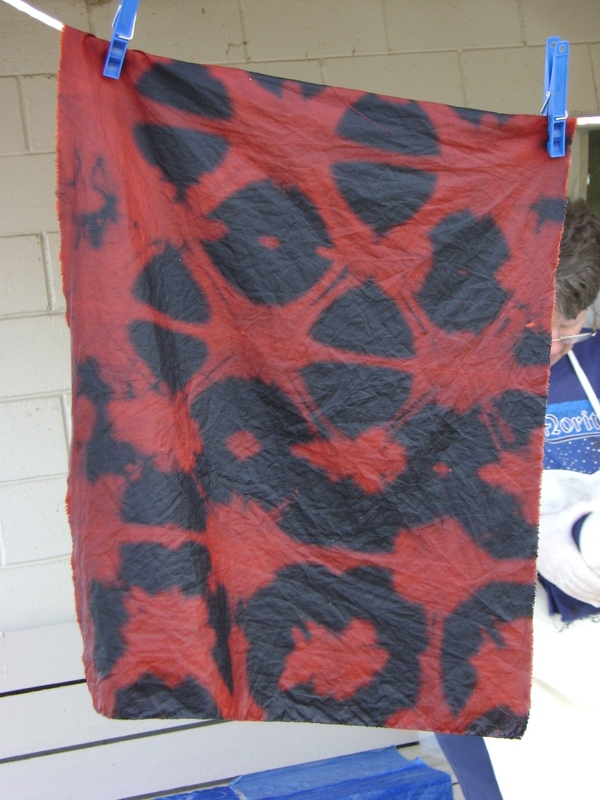 On the 12th I taught basic dyeing and discharging classes with a few gals from the Raintree quilt guild. Here are some of their stunning results with discharging. 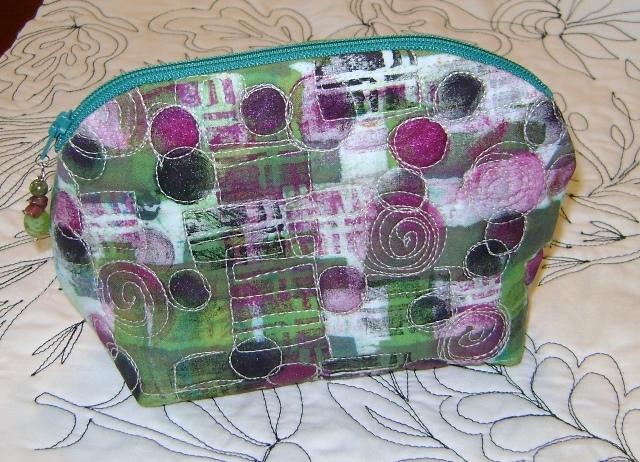 My friend Robin Koehler went to quilt market in Minneapolis this year and brought me back a present. She found some guy demo-ing a new (?) discharge product and got me a sample bottle to try out. She said the guy wasn’t using any kind of protection such as a face mask (shame on him). 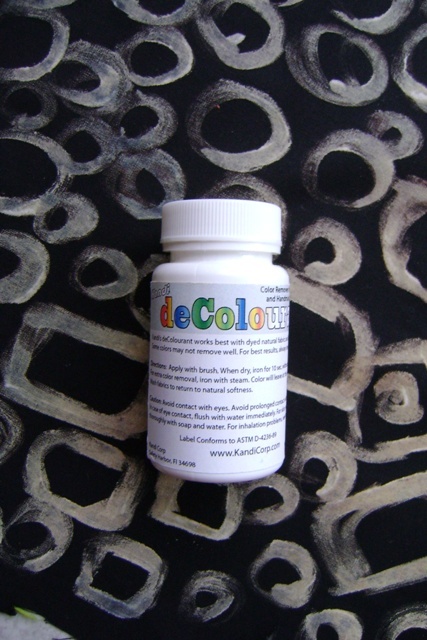 The product’s name is DeColourant and is produced by the KandiCorp company. You apply the paste to your cloth, let it dry, then iron it. I tried it, I like it, but you should wear a mask. The smell is not as strong as regular discharge paste, but it has the same chemical in it. Here are my results. The final after-washing look on black cotton is not quite white…leans more beige, but I like the look. It looks more white when you first iron it, but changes a bit after washing. 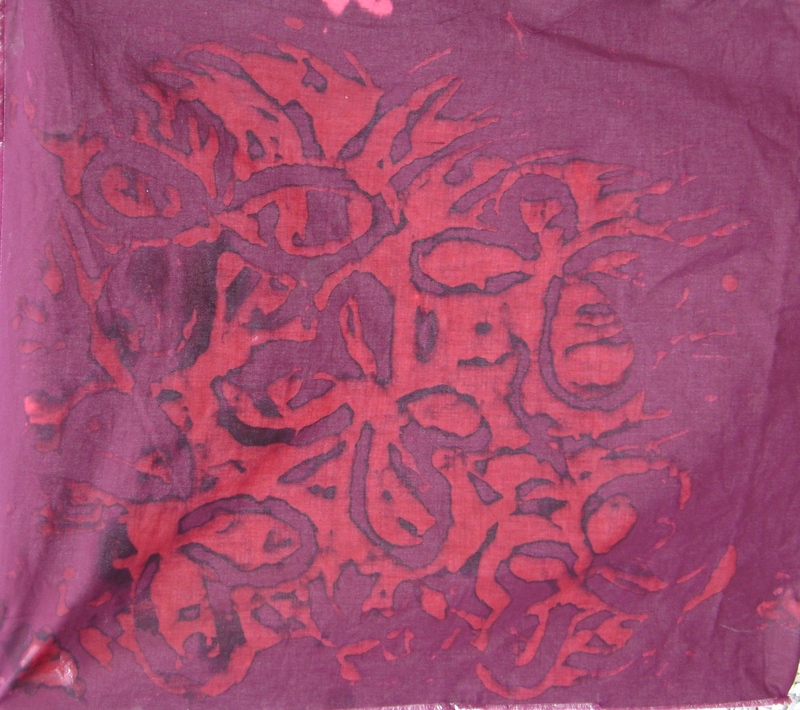 And this is what the color looks like after washing. I was right about this new dye color called Curry. It is phenomenal. 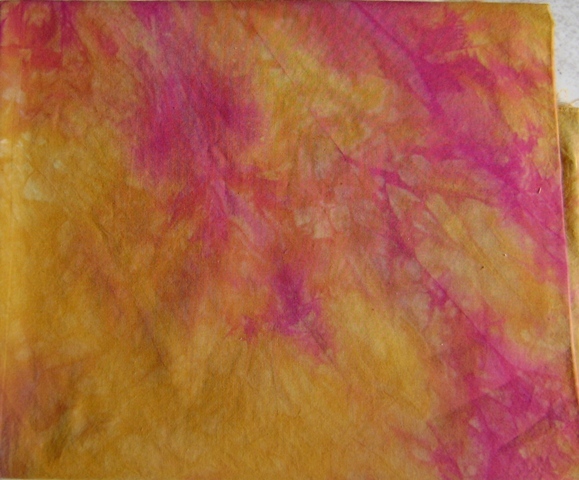 Shown here with streaks of Amethyst, I love the rich golden “curry powder” color. 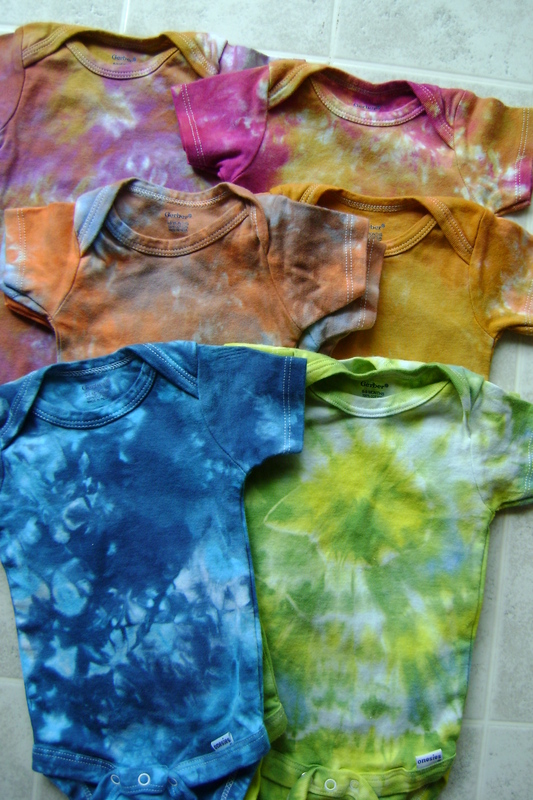 The plan was to clean out the 5 onesies I had in my room that I planned on dyeing a long time ago and never did. Instead, because they were so cute and I have some events coming up I think I could sell them at, I purchased MORE! We’ll learn shortly if this was a good idea or not. Like the donut design? That is from a pool noodle. I cut slices of it and used it as a stamp. Now off to do the rest of the things on my list. 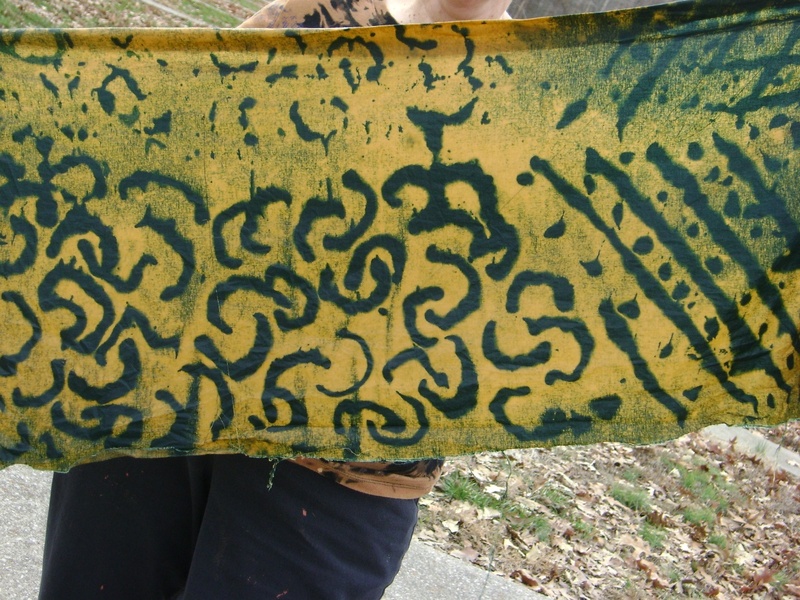 I might have a little fun today and make some more paper cloth….er..well…that’s not officially on my list. The Funk In The City “art festival” was a total bust for me. 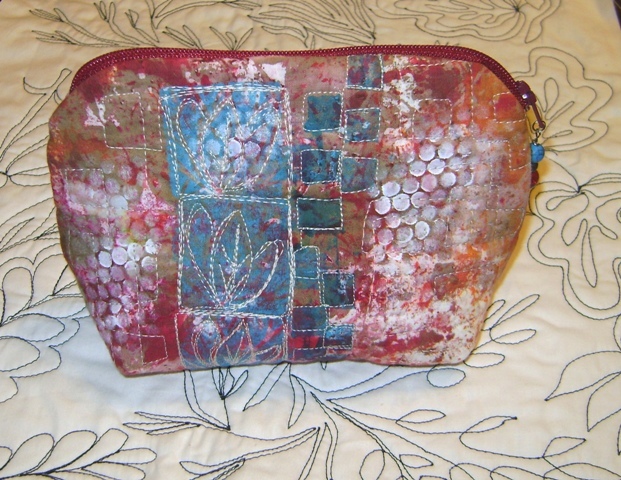 I like what another vendor said…”I sell more than this at my crappiest shows”. Yeh, what she said. There was a gal next to me selling ceramic mushrooms for $5-$6…could that have anything to do with it? And the more I thought about it…surely they had to come from China. So what’s there to say about a show like this? How about…I won’t be back! And so many people I know have raved about this show. Sigh. Anyway, on to the next thing…I have some classes scheduled, a trip out of town where I will be visiting with friends and seeing Quilt National (yeh! 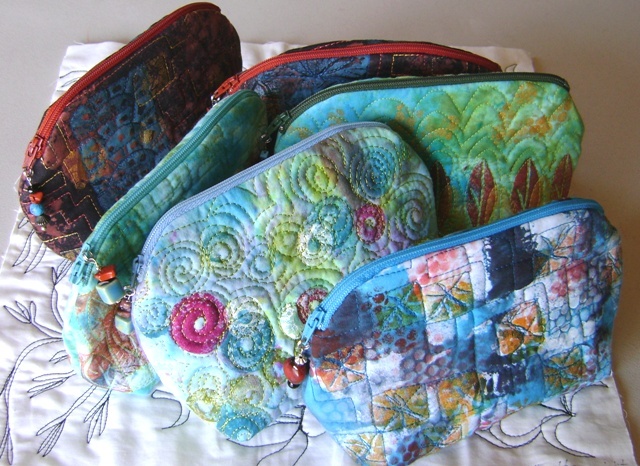 ), and a one day quilt show event. Perhaps I can even work on some art this month… that would be fun. 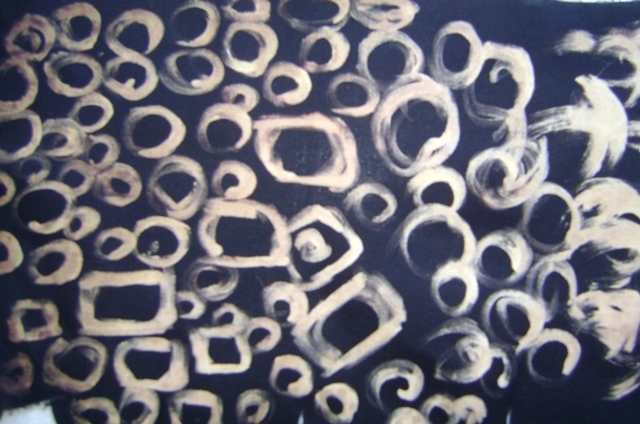 I am feeling inspired to do some printing so that I can continue exploring with the piece of cloth from the previous post. I am stirred to create. Another task is to begin photographing all the things that didn’t sell! to start listing in my Etsy shop. 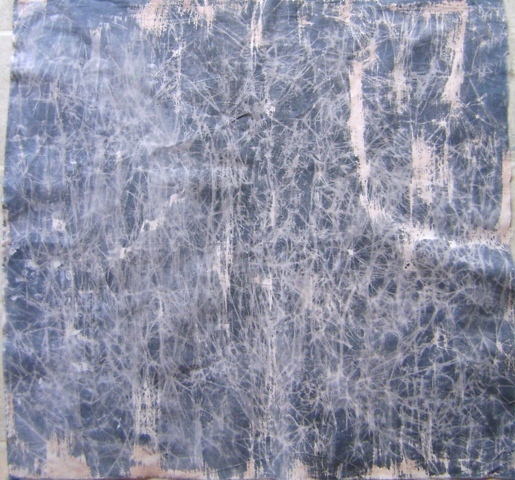 Photo…gray hand dye that I “painted” with soy wax, froze, crumpled, then brushed dish gel over it to discharge it. 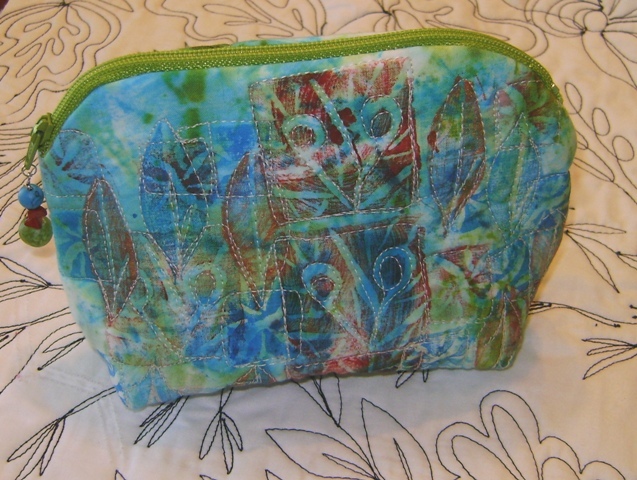 I am working today making more bags…just two more festivals to go and then maybe I can “rest” a little. Ha! 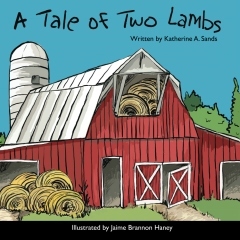 Dear Readers: In my haste to get ready, load up the van and get to breakfast on time yesterday, it never once entered my head to get the camera! I’m just not in the habit of carrying it with me to meals…yet! I am going to have to get advice from Gerrie since she always has lovely pictures of food and meals, even when they eat out. But I can describe it for you…we had a fruit dish of bananas and strawberries, small stack of pancakes, sausage patties, hard fried eggs with a soft white cheese melted on top (never had that before! ), juice and coffee. Yes, it was another wonderful breakfast. If anyone questions my infatuation with my breakfasts the past few days…let me explain. My husband goes to work early and we don’t fix breakfast. Every morning I have a bowl of bran flakes with soy milk and dried cranberries on top…that is it. Being at the bed and breakfast this week was quite a treat as far as breakfast was concerned! And someone else was fixing it…and it was way better than the continental breakfasts you get at a motel for the same price. 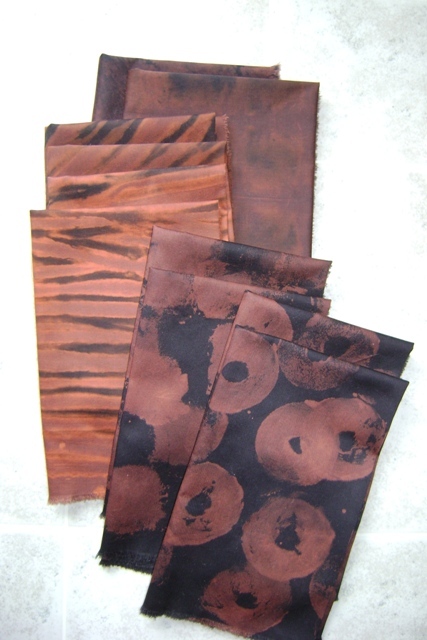 Anyway, I sold a few more scarves yesterday…that was very encouraging. 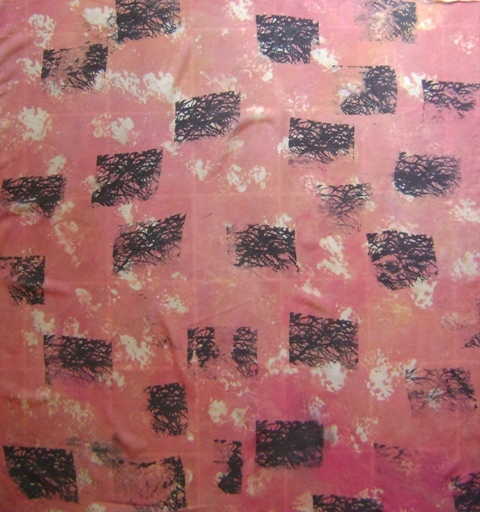 Right before I left, I worked on some large square chiffon scarves and was quite pleased with how they turned out. Every day I draped a new one over my “dummy” to see public reaction. The third one sold, and it was one I ran out of time on and planned on doing more to it when I got back. The sale saved me more work! 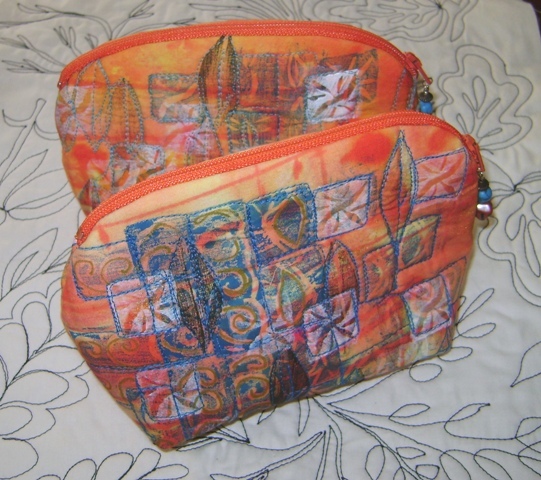 I still have these two…the one that sold was a bit more reddish than the orange one above. 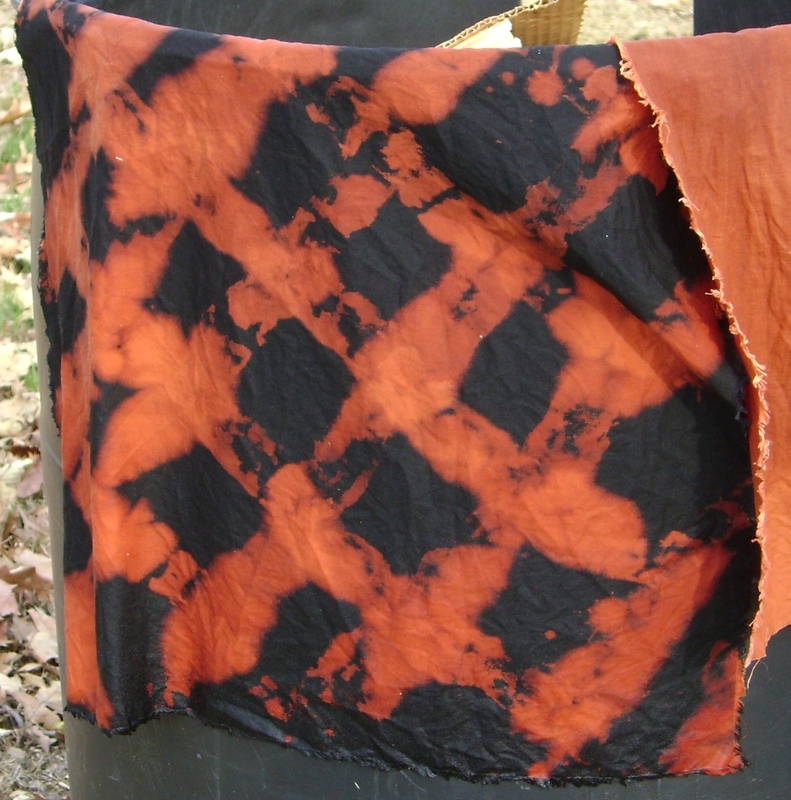 I discharged it the same way, but didn’t like the color so I overdyed it. The discharged areas were more muted. I also used the same screen print on it that the orange one has. 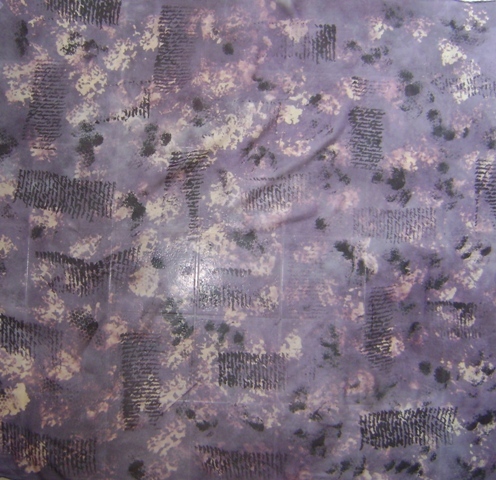 It is a Thermofax print of a picture of tree branches. I’m back home now and need to re-stock my inventory…next art show is in two weeks. 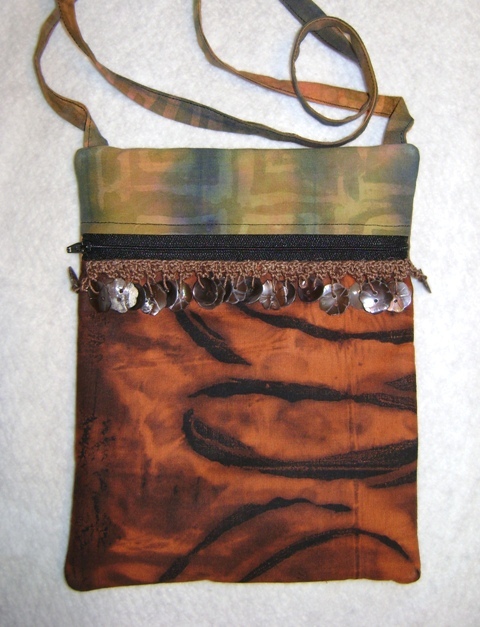 I made another Runaround bag…it makes up so fast and easy. 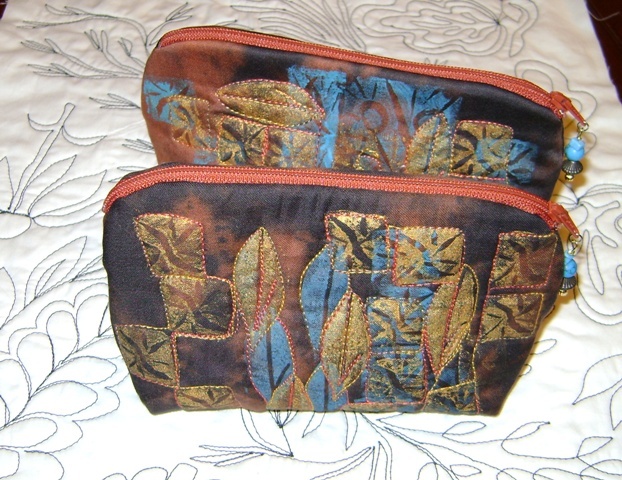 This one is made with discharge dyed black cotton with another piece of my cloth and then adorned with leftover chocolate button trim from Moda. 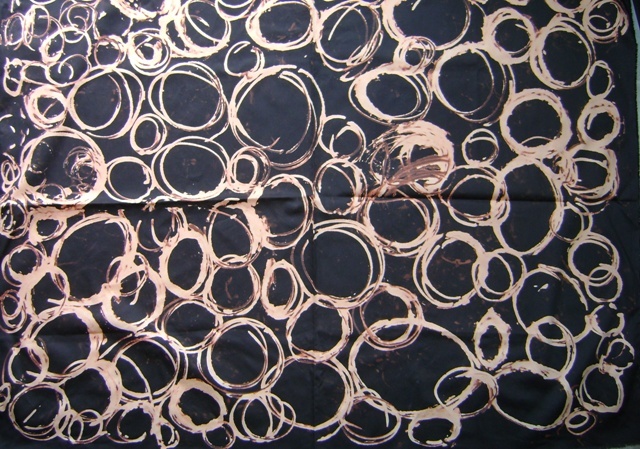 A piece of black cotton sateen discharge dyed in circles. 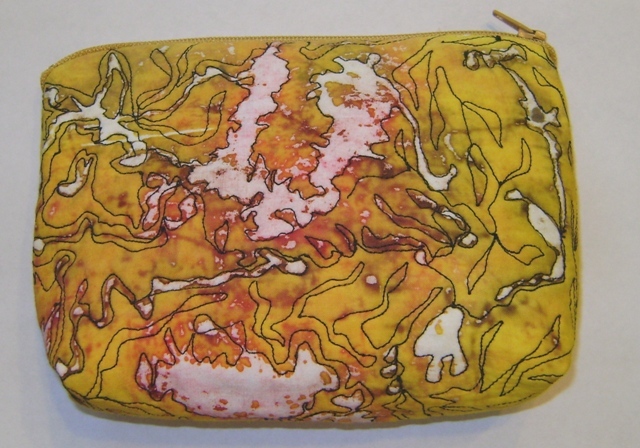 I left the dishwashing gel on it for a long time, so it bleached out quite a bit. 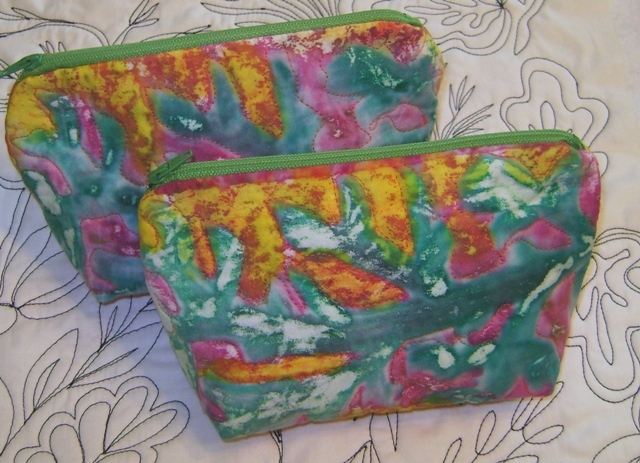 And lastly, some small bags I have been making using deconstructed screen prints. 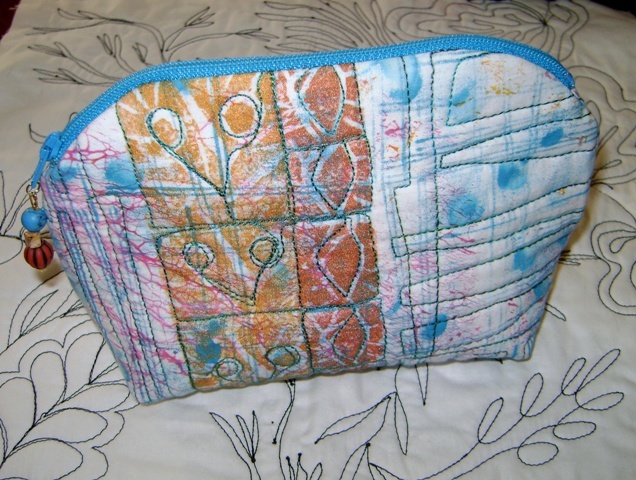 The prints are just the right size, and after layering and stitching them, they make a cute makeup bag.